Use the degree key to enter expressions written with angular measurements in degrees. Note: trigonometric units are in radians by default. 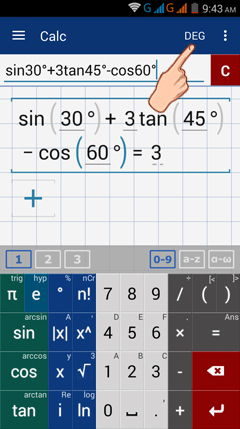 Degrees mode automatically adds a degree sign to the numerical arguments of trigonometric functions. 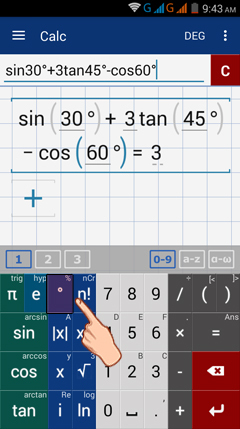 Activate it by tapping RAD (radians) in the top right next to the options button so that it switches to DEG (degrees). Tap it again to switch back to radians. Note that the degrees sign is automatically ​added in the workspace. Tap the degree key three times to use the dms function. 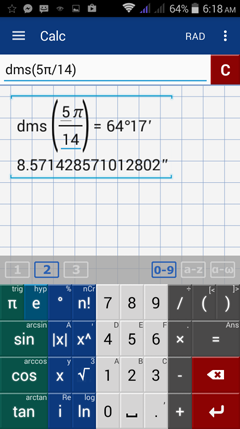 The dms key is used to convert radians into degrees, minutes, and seconds. Enter the radian measurement in parentheses, especially if it is expressed as a fraction or is in terms of π. Convert 3π/4 radians into degrees. 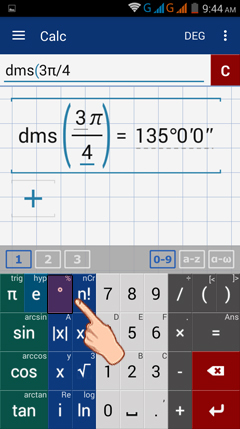 ​ Use "dms" by tapping the degree key º three times. The result will display the equivalent measurement in degrees, minutes and seconds. Convert 5 π/14 to degrees and minutes.